Your Indiana DECA State Leadership Team has been hard at work this year to help improve the DECA experience for members throughout Indiana. One of the team goals in their Program of Leadership for this year revolves around community service. As you can see in their fall newsletter, your leadership team has chosen MDA as their focus to bring chapters together and support this organization in a statewide Push Day during National DECA Month in November. They are asking each local chapter to select a fundraising event that would take place on November 9 at your school or in your community to raise money for MDA. You will find a list of fundraising ideas here. The activity can be as simple or as complex as you want it to be based upon what best suits your individual chapter, school and community. You will also find a Social Media Guide here and Social Media Tips below to promote your event along with other materials to help with the project selected by your students. A flyer can also be found here. MDA will then journal all funds to the local office to ensure that all the income stays in your community. 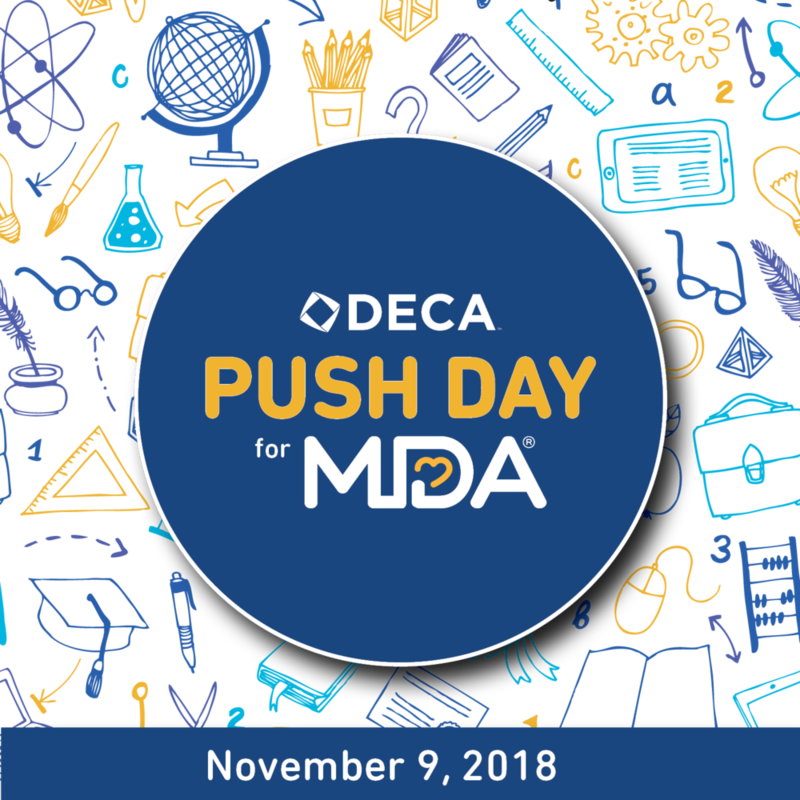 The idea is that every chapter and their chapter members are doing something on November 9 to collectively make a positive impact for MDA families in their local communities during DECA Month. With a small amount of effort from a lot of chapters throughout the state, Indiana DECA can make a difference in the lives of children and adults living with muscular dystrophy! Remember: This activity could be used for a Community Service Project in the Chapter Team events for competition or used as a community service component in the chapter campaigns.